Christie's is to offer a blue glass jug made by the Roman glassblower Ennion. The piece will lead a sale of ancient glass from the Shlomo Moussaieff collection in London on July 6. It's valued at £450,000-550,000 ($598,050-730,950). Ennion is believed to have lived and worked in the city of Sidon in the Lebanon during the 1st century AD. He invented the method of blowing glass into moulds, allowing him to mass produce his complex and delicate works. He is remembered because he signed his moulds with "Ennion made it" in Greek. Today his work is among the most valuable and sought after on the market. The present lot is one of three footed jugs known to exist, another of which is housed in the permanent collection of the Haaretz Museum in Tel Aviv. 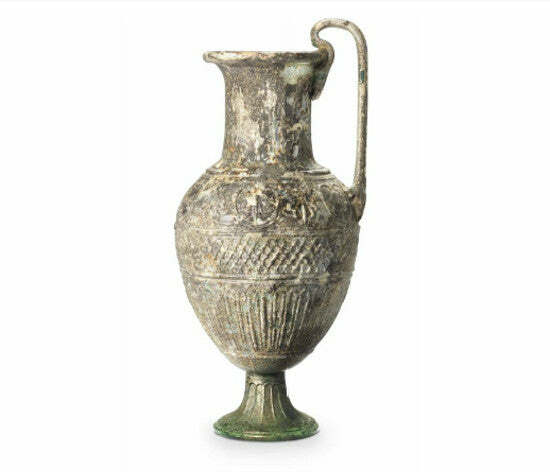 The collection features a range of Ennion's work, including a two handled amphora that is valued at £400,000-600,000 ($531,600-797,400). It's one of just two two-handled amphora Ennion created, the other of which can be seen in St Petersburg's Hermitage Museum. A purple amphoriskos by an unknown maker, displaying scenes from the legend of Ajax, could make £60,000-80,000 ($79,740-106,320). It also dates to the 1st century AD and has developed an attractive patina in the intervening centuries. The record for any piece of Roman glass stands at £2.6m ($3.4m), set for the Constable-Maxwell cage-cup at Bonhams in 2004.